For a movie as excellent and prestigious as City of God, the new Miramax DVD hardly does it justice. The movie is still outstanding on home video, but in the age of extra features and audio commentaries, City of God is a sparse package. 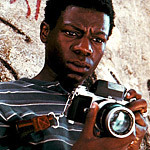 City of God’s story is told by a young photographer named Rocket (Alexandre Rodriguez), who narrates from the present. (There is some comfort in knowing that someone managed to survive the events of the movie.) Rocket grew up around hoods. His brother was part of “The Tender Trio,” a gang that robbed the occasional gas truck or motel. Director Meirelles shows the cheapness of life when the cops walk right past one of the suspects and gun down an innocent bystander. When they realize their mistake, they plant a gun on the corpse and fire it, the bullet almost hitting the perp who had walked past them. The Tender Trio look like choirboys compared to Li’l Dice, a sociopathic seven-year-old who enjoys murder and wants power and respect. Li’l Dice grows up to become Li’l Zé (Leandro Firmino da Hora), the most ruthless, most powerful drug dealer in the slum. But even his reign is threatened by a newer, younger generation of thugs who discover guns before they discover girls. City of God treats its subject seriously and honestly. It looks closely at the details of crime and poverty without turning away in revulsion or dismissing the hoods as non-human beings. Because the film keeps its eyes open, you can bring anything you like to the film and get something in return. In a way, City of God is like Lord of the Flies. Both stories ask what human nature is, deep down at its core. City’s answer is bleaker, and unfortunately, it’s also based on a true story. Although City of God is excellent, it is not for all audiences. The MPAA doesn’t provide an adequate “adults only” rating for violence, which City of God demands, not for blood or gore, but for the shocking images of children murdering children in the slums of Brazil. The documentary tells a similar story to City of God through interviews with cops, gangsters, and slum-dwellers. These dangerous neighborhoods are run by gangsters because police are reluctant to go in, which makes the residents not trust the police, which encourages armed vigilantism, which make the police even less likely to enter. When they do go in, they’re ready. One cop interviewed brags that they’re the best-trained, best-practiced urban combat unit on the planet. Nowhere on the DVD does it explain the connection between the documentary and the movie: that Paulo Lins, one of the subjects in the documentary, wrote the novel on which City of God is based. That seems like a big oversight, but on this sparse DVD, it’s hardly surprising. The only change I noticed from the theatrical release to this DVD release was that the hard-wired chapter titles (e.g., “The Story of the Apartment”) that were in Portugese in the theatrical release have been translated into English. City of God packs an emotional punch that seems to bypass the senses. The movie has a rough, photographic, grainy look to it that would probably allow even a bad transfer to convey its power. The picture quality is good. It’s not “crisp” because it’s not meant to be, but it looks very good. The movie is presented in a 1.85:1 widescreen aspect ratio, and the sound is encoded in Dolby Digital surround.